For the the month of November, I have been posting a photo (or perhaps a few) each day of something that invited me to pause and lifted up gratitude, joy, perhaps a quiver of awe in my heart the moment I stopped to be present and really see. By reviewing the image/images to share with you, the experience is engraved deeper in my consciousness, strengthening a reserve of gratitude and goodness to savor and draw upon when gloomy weather outside echoes inside, or vice versa. For me this is a devotional photographic journey for developing the soul quality of Hakarat Hatov… recognizing the good, a Jewish spiritual practice for cultivating gratitude. We are up to 75 entries so far. Last year over 200 people joined from all around the world, I hope you will add your words of gratitude again this year if you have in the past and for the first time if you haven't before. Instructions for how to participate can be found at the top of my blog. Sorry if I am slow getting around to visit this week. We have been experiencing internet issues again, as in NO CONNECTION… but my hero husband has fixed it. Lets hope it stays on now. Such a wonderful little heart, I love it! The little ice laced heart is so beautiful. This is why I enjoy macro so much, we have to get up close and personal and really see the detail. So joyful to see your frosted heart, what a wonderful gift! Love your little frosty green heart! Lovely shot, Laura! Thank you for hosting. Thanks Laura for hosting. You have choosen a wonderful pic. Lovely! Have a good sunday. such a cute little frozen heart ! How wonderful! The frosty leaf looks like a heart. ooops ! I am sorry but I have just realized that I put the wrong link, I will try the good one but then I will have TWO publications this week ! The frosted heart is lovely. Your heart is so beautiful dear Laura. It could not be more fitting for your project. unusual phenomenal shot, love it! Fabulous find Laura, and as always beautifully photographed. What a perfect heart and such a fabulous find! Have a super great week! Wow, that is an amazing shot, a heart shaped leaf encrusted in 'jewels.' Thank you for coming by sharing your creative photography on the Weekly Top Shot, #108! such beautiful macro of the leaf, very exquisite! What a lovely find, a beautiful heart leaf. Have a happy week ahead! Wonderful frozen heart, but full of hope! Beautiful photo of this heart leaf! Nicely done! I Love your little frosty green heart! The frosty leaf looks so much like Nature's Christmas decoration. Enchanting. So cute ... and very a beautiful capture! A perfect picture - great! That is an amazing photo! Very beautiful! That heart-shaped leaf is delightful. What a terrific shot! I love everything about it! I do not know how you do it, what a gift! Wonderful image. 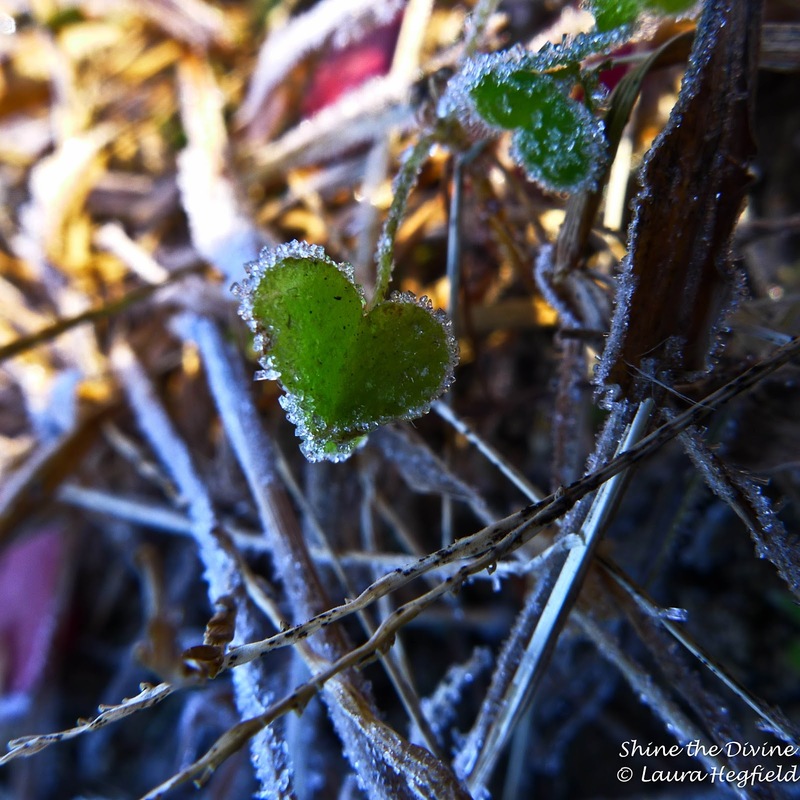 how wonderful and fragile this little, frosted, green, heart leaf is!!! This picture is touching my soul so much!